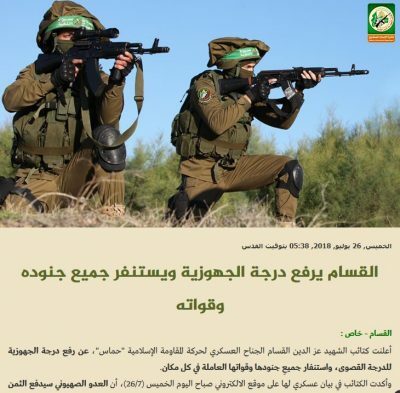 After the Israeli army killed three of its members, the Al-Qassam Brigades, the armed wing of Hamas, issued a statement, on Thursday morning, declaring a high alert, and calling on its members to be ready for a possible imminent Israeli escalation. It is worth mentioning that, on Wednesday at night, one Israeli soldier was moderately injured, by what is believed to be sniper fire from Gaza. The soldier was shot near Kissufim crossing, before he was rushed to an Israeli hospital. Israeli sources said the wounded soldier was rushed to Soroka medical center, and underwent surgery for gunshot wounds, and added that his condition was first described as serious, but was later described as moderate, after his surgery. 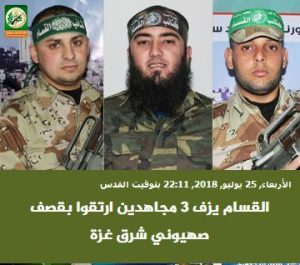 The three fighters, killed by Israeli missiles, have been identified as Ahmad Monir al-Basous, 28, ‘Abada As’ad Ferwana, 29, and Mohammad Tawfiq al-‘Ar’ir, 27. On Tuesday, the Health Ministry in Gaza has confirmed that Majd Soheil Mohammad ‘Oqeil, 26, died from serious wounds he suffered, on May 14th, after Israeli soldiers shot him with live fire in northern Gaza. On July 22, a young Palestinian man, identified as Karam Ibrahim Arafat, 26, died from serious wounds he suffered on June 8th, when Israeli soldiers shot him with live fire east of Khan Younis, in the southern part of the Gaza Strip. On the same day, during pre-dawn hours, the soldiers invaded Deheishe refugee camp, south of Bethlehem, and killed a child, identified as Akram Tha’er Mizhir, 15. Over the past hundred days, Israeli forces have killed 147 Palestinians, and wounded more than 17,000 participating in non-violent protests at or near the parameter fence in Gaza. No Israelis were killed in Gaza until this past Friday, when Israeli bombs killed two Palestinian children, and Palestinian fighters fired at an Israeli military base with gunfire, killing one soldier, identified Staff Sgt. Aviv Levi, 20; the the first soldier to be killed by Palestinian fire since Israel’s offensive and major deadly assault in Gaza in 2014.